Bicycle Everyday Zombies Playing Cards feature the illustrated work of artist Rob Sacchetto. Sacchetto's one-of-a-kind card creations are featured only in this unusual deck. 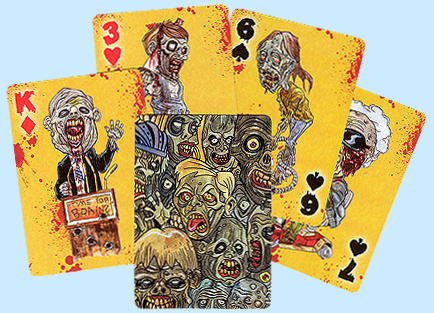 Everyday Zombies Playing Cards have a common back design and 52 different face card designs. Each card face displays a zombie doing some sort of everyday activity – running, taking out the trash, talking at the water cooler, and much more. Everyday Zombie Bicycle Playing Card Decks are poker/wide size, and they are made on top-quality, Bicycle brand card stock. The decks are in stock for immediate shipment. For additional information or volume pricing on Bicycle Everyday Zombies Playing Cards, please contact us at 1-800-233-0828.